This installment of the Star Log.EM-series clocks in at 7 pages, 1 page front cover, 1 page editorial, 1 page introduction (including a summary of alien species), 2 pages of SRD, leaving su with 2 pages of content, so let’s take a look! The feats herein are intended for Alien Archive races, and Dragonkin, Formians, Grays, Nuars and Witchwyrds have their roles in the Xa-Osoro system, as noted, explained on the introductory page. -Balloon Flight: Requires haan subtype, nets you 30 ft- flight with average maneuverability. You must end movement on solid ground or fall, at least until 5th level. -Balloon Maneuver: You gain the haan’s balloon ability, but take -4 to atk unless you spend 1 Resolve. Save DC is governed by Dex. -Dark Attunement: Requires Draelik subtype; lets you become graviton-attuned as per the solarian’s stellar alignment. You also get a graviton revelation. You can choose a graviton-based variant of supernova, at one fewer damage dice. It deals negative energy damage and reduces the light level by one step for 1 round. If you have stellar alignment, this also tilts the cap before costs to become fully attuned increase. -Draconic Resistance: Gain class level fire resistance. -Improved Draconic Immunities: 17th level +, immunity to fire and paralysis. -Resolute Breath Weapon: When you’ve used your breath weapon and haven’t rested to regain stamina, you can pay 2 Resolve Points to recharge it. -Improved Gray Magic: Minimum level 5th; 1/day detect thoughts, mind link; at-will detect affliction. All SPs, counts as Minor Psychic Power, and you may use Int instead of Cha for the purpose of meeting the prerequisites of such feats. Also may be taken additional times as alternate class features, granting you a new array of SPs at 2nd and 3rd time you take it. Previous SPs are upgraded. -Improved Phase: Also requires 5th level to take; lets you use phase as a standard action or reaction. As a standard action, the effects apply to all attacks and you only take half damage from AoE effects and may pass through walls and objects, but not creatures. Force effects still hinder you. Ouch! The walk through walls effect is really tough,,,and what happens if you can’t exit an object entered? -Grey Probe: Requires 7th level; Gain grey prove 1/day, save Dc governed by key ability modifier; use Resolve to use it more often. -Four-Armed Onslaught: Requires that you can make 3+ attacks duringa full attack and BAB +16 or higher and 4+ arms: When you take a full attack and make 3+ attacks, the penalty to the first of these is reduced by 1. -Nuar Knockdown: Nuar, Str 13+, BAB +2; gain the race’s knockdown. -Three-Dimensional Tactics: Wis 13+, BAB +2, Kalo: Gain three-dimensional tactics. -Deadly Grasp: Nets you an unarmed strike at -4 as a move action on a success of a grapple maneuver check to maintain a grapple. -Toxic Sting: You may inject formian toxin as a swift action when hitting an enemy with an unarmed strike. Save is governed by Constitution. -Pure Silicon Physiology: Get a racial bonus to saves vs. poison equal to the character’s level. 8th level upgrades this to immunity. -Urog Discharge: Requires third level; nets you Urog Discharge, with damage equal to 1d4 + character level. -Semiconductive: Requires the previous feat and 9th level: Gain semiconductive ability. -Witchwyrd Toughness: Requires 3rd leve; Gain DR/magic equal to ½ your level. -Wicthwyrd Magic: Requries 5th level; You gain the following SPs: 3/day unseen servant, at-will detect magic/detect tech. SPs are not properly italicized. Feat follows the design paradigm of the gray feat and may be taken as an alternate class feature and multiple times for additional SPs/more uses. -Witchwyrd Resistances: Gain the witchwyrd’s resist energy ability, but resistance is ½ your level. Editing and formatting are good on both a formal and rules-language level. Layout adheres to the series’ nice two-column full-color standard and the pdf sports a nice artwork. It has no bookmarks, but needs none at this length. 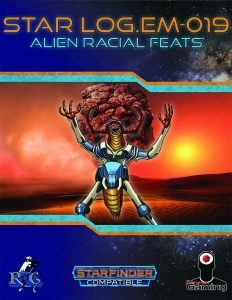 David N. Ross’ alien feats are solid, if pretty much what you’d expect. The phasing feats are a bit rough, and as a whole, I honestly wasn’t excited by anything in this mini. The material isn’t bad, but neither did it blow me away in any way. My final verdict will clock in at 3.5 stars, and while, for me as a person, this is closer to 3 stars, I have an in dubio pro reo policy and hence will round up.